We just love ourselves some robust, savory casseroles – especially with perfectly balanced undertones of sweetness, and this unique baby is one of our favorites! The combination of crispy fried and coconut-soaked onions along with butternut squash and spiced pork is an exotic flavor explosion! All you’ll need to cook this up is a single skillet and a baking dish, so you’ll appreciate the minimal cleanup! For a heavenly little twist, try this recipe with pumpkin instead of squash. 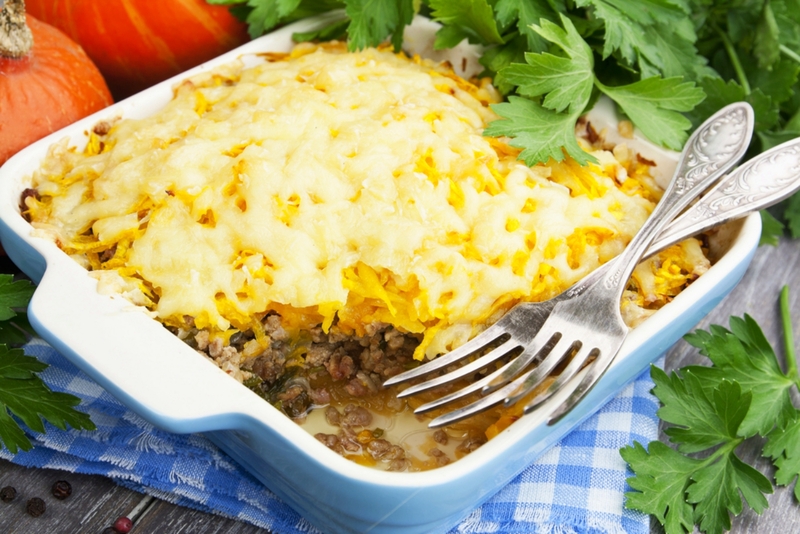 Tip: This casserole not only keeps well in the fridge overnight but actually tastes even better reheated the next day. Something about all these ingredients together just works. Trust us and try it. You won’t be sorry! Preheat the oven to 400° F and lightly grease a 9x13 inch baking pan. In a large skillet, on medium heat, cook ground pork, green bell pepper and kale until pork is crumbly. Add garlic, cumin and cinnamon and cook briefly. Remove from heat and transfer to a large bowl. Stir lentils and raisins into the pork mixture, season with salt and pepper and set aside. In the same skillet, heat half of olive oil (1 tablespoon) and briefly sauté butternut squash. Pour in about 1 cup water, bring to a boil and cook, covered, for 10-12 minutes, or until squash is soft. Drain and discard water, transfer squash to a medium bowl and set aside. In the same skillet, heat remaining olive oil (1 tablespoon) sauté chopped onions with turmeric until turmeric powder is dissolved, then add coconut milk and cook until onions are slightly soft. Season with salt and pepper and remove from heat. Spread pork mixture evenly into bottom of the baking pan, spread squash evenly over pork, then spread onion turmeric mixture evenly over the top. Bake for 25-30 minutes, remove from oven and top with crispy fried onions and Gouda or Monterey Jack cheese. Bake for another 8-10 minutes, until cheese is melted.